biopsies as part of their clinical research and asked them to describe their methods and data to our audience. We found two experts who were utilizing vastly different methods of liquid biopsy to predict, diagnose, and track the progression of disease in patients. John Martignetti, M.D., Ph.D., associate professor of genetics and genomic medicine at The Mount Sinai Hospital, gave the first presentation and described how he is using ctDNA to predict in real time the progression and outcomes for ovarian and endometrial cancers. The second presentation was given by David Wong, D.M.D, DMSc, associate dean for research at the UCLA School of Dentistry, who discussed how an entirely noninvasive biofluid like saliva can be utilized for systemic disease detection. 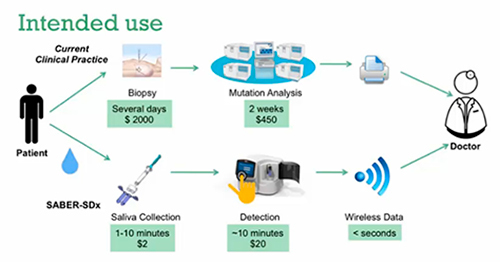 For those who want just a brief overview of the presentations, here follows a recap of some key points about why liquid biopsies represent a significant advancement in molecular diagnostics and patient care.